Poor BMO. He hasn’t appeared in a single episode this season, and being stuck in Finn and Jake’s tree house while they’re off having adventures has taken a significant toll on his psyche. 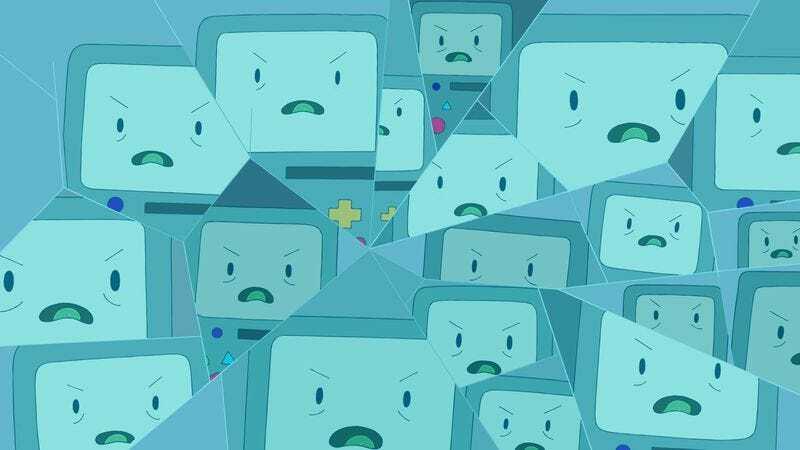 BMO’s strange methods for warding off his loneliness have been detailed in episodes past, but “Football” is the first time we see just how serious the consequences of BMO’s solitude are. BMO’s female personality Football has thus far only appeared in two “Graybles” episodes in very silly shorts, but writers and storyboard artists Emily Partridge and Luke Pearson use the conflict between the character’s two selves to create a suspenseful psychological thriller this week. It all starts off in the typical BMO and Football fashion—totally innocent and adorable—with BMO talking to Football through the bathroom mirror, enjoying a cyclical conversation where they keep telling each other how much they love each other. That affection is what inspires BMO to switch places with Football when she tells him her secret longing to spend one day on the other side of the mirror, but that decision has consequences BMO never considers. Finally free from the bathroom, Football is overjoyed by the beauty of the natural world and the company of Finn, Jake, and Carlos the duck (his best friend since college), so in love with the world that she decides to stay on the other side of the mirror forever. That’s when things get dark. Football calls for a family meeting and tells her housemates that BMO has left forever, but they just think BMO is putting on a very surreal show for them. Jake recognizes that something is wrong with Football and tries to offer some emotional support, but his words go unheard because BMO has found a way to haunt Football through any reflective surface. This is when the psychological horror kicks in, and no matter where Football goes she is haunted by BMO. She smashes every reflective surface in the house, flees to the roof, and eventually ends up falling into the pond outside, where BMO is waiting to reenter his body when Football hits the water’s reflective surface. Earlier this week, Slate published a piece about how the world of TV animation is helping independent comics creators find financial stability, and Adventure Time has greatly benefited from this relationship between TV and comics. All of this week’s episodes have featured comic creators Derek Kirk Kim, Michael DeForge, and Joy Ang on character and prop design, and Pearson is the mind behind the delightful Hilda series of graphic novels, which share a lot of qualities with Adventure Time: cute characters, rich environments, stories that balance humor and drama, fantasy and reality, silliness and sophistication. He worked on two excellent season 5 episodes, the hilarious crime procedural pastiche “Candy Streets” and the strange, exhilarating “Frost & Fire,” delivering some of the series’ best action sequences in the context of a story about Finn’s pubescent sexual awakening. Pearson made a big impression on the series, and taking a season off hasn’t diminished the quality of his work in the slightest. “Football” has him working with Emily Partridge instead of Somvilay Xayaphone, and this new collaboration is a very fruitful one. They create an episode with a lot of heart and wit, but they also incorporate some very dark elements for a captivating contrast. It’s an intense journey for BMO, spotlighting the character’s complexity as he makes his season 7 debut. Why is the tree house full of grapefruit? It’s definitely a shout-out to Football’s past appearance in “Five More Short Graybles” where BMO uses her how to use a grapefruit spoon, but I also wonder if the tree the house is built in is a grapefruit tree. That would explain why there’s so much. I love Jake’s size-changing gags this episode, particularly him hiding in a grapefruit, then expanding from inside the grapefruit to turn the rind into a little hat. The timing for Jake getting hit in the head by a grapefruit is perfection. It makes me belly laugh every time. BMO: “Can I tell you a secret?” Football: “Of course, BMO. 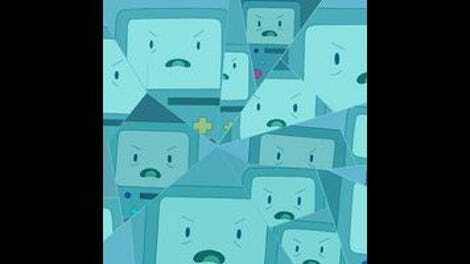 You can tell me anything.” BMO: “I love you.” This opening scene is so damn cute.